After a surprise from Andy Rubin at D:Dive Into Mobile, a tease from Motorola themselves, and many rumors surrounding it, the Honeycomb powered Motorola Xoom is finally official. 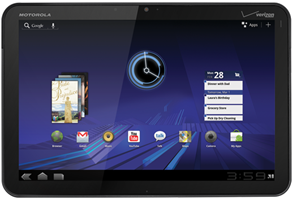 Announced today at CES, the Xoom will pack a dual-core 1GHz Tegra II processor, 1GB of DDR2 RAM, and vanilla Android 3.0. The Xoom eschews the recent trend of 7-inch displays on tablets, and instead opts for a 10.1-inch 1280x800 (16:10) (gorilla glass) display, which should complement the 720P video playback capabilities nicely. For more information on the tablet, check out the official website here. Motorola XOOM redefines the tablet device category by providing more ways to have fun, connect with friends and stay productive on the go. It allows consumers to experience HD content right on the device, supports 1080p HD video and HDMI output to display content on larger HD screens, and plays video and other rich web content seamlessly with Adobe® Flash® Player. Motorola XOOM features a front-facing 2-megapixel camera for video chats over Wi-Fi or 3G/4G LTE, as well as a rear-facing 5-megapixel camera that captures video in 720p HD. It delivers console-like gaming performance on its 1280x800 display, and features a built-in gyroscope, barometer, e-compass, accelerometer and adaptive lighting for new types of applications. 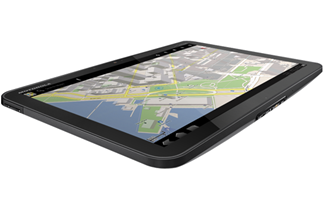 It also features Google Maps 5.0 with 3D interaction and delivers access to over 3 million Google eBooks and thousands of apps from Android Market™.